Raffles City Rocks Shanghai with More White Castle, Stockholm Closes, and Jackie's Beer Nest Getting Demolished? 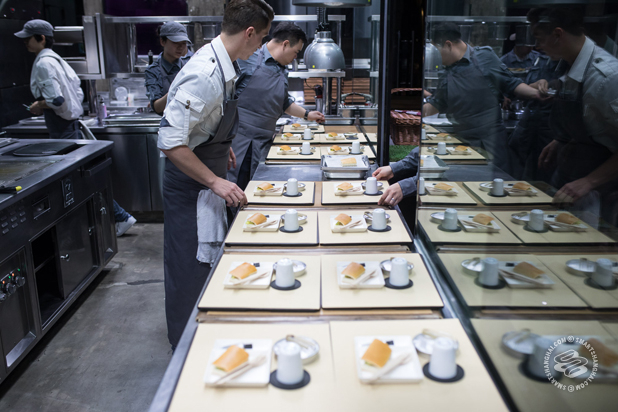 SmSh got a backstage pass to one of the greatest food shows on earth. 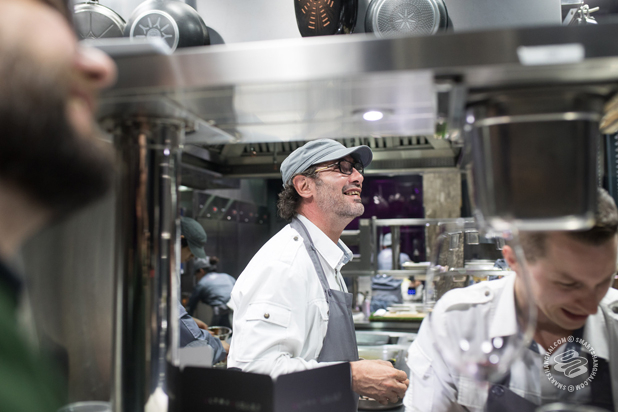 Chris St. Cavish and photographer Charlie Xia go behind the scenes of Paul Pairet's Ultraviolet as they serve their new menu, UV-C. There are more chefs than guests. 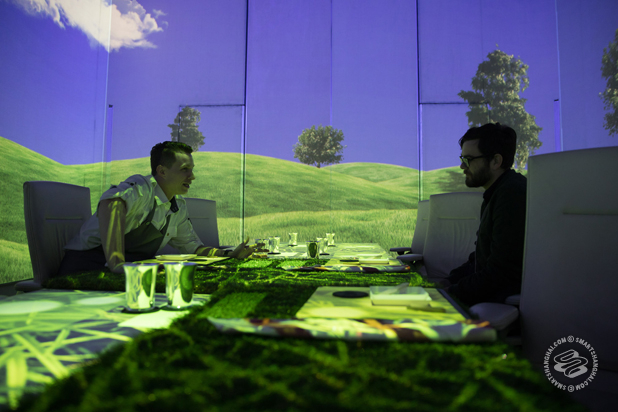 The dining room is only 80 square meters but in order to pull that off, Ultraviolet needs a 1,000 square meter warehouse. It would cost close to 20 million RMB – two million per seat – to build a new Ultraviolet. French crystal brand Baccarat gave them a chandelier but it wasn’t that kind of restaurant, so they put it in the bathroom. 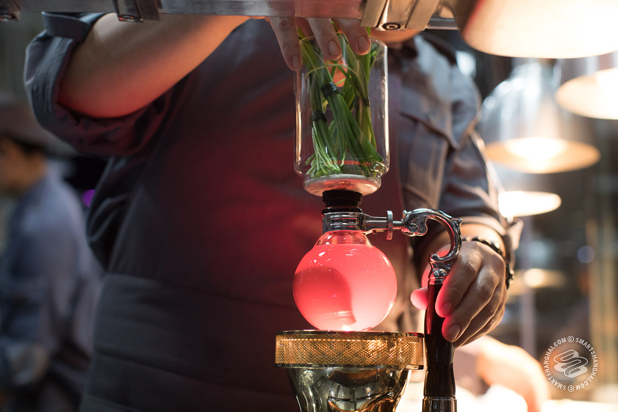 These are the things you learn backstage at Ultraviolet, recognized in global publications and critical platforms as one of the most innovative restaurants in the world. 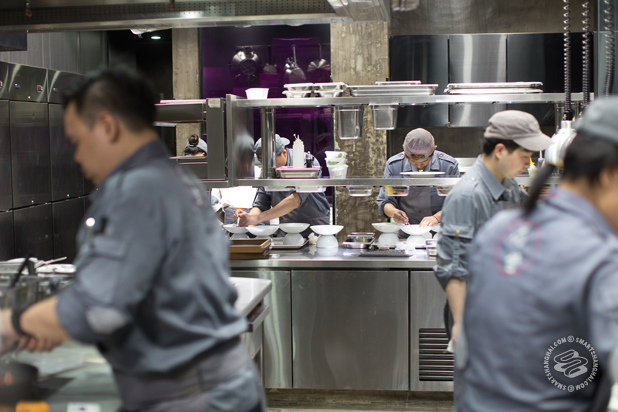 You rarely read about the dinners that chef Paul Pairet and his team are cooking there – most people who spend 6,000rmb on a meal (4,000rmb on Tuesdays and Wednesdays) don’t bother recapping on City Weekend. 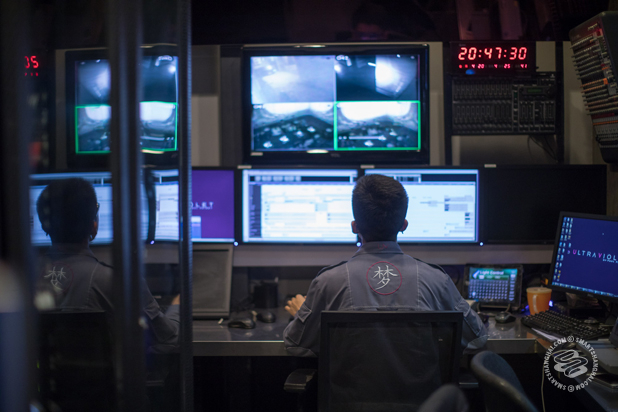 But – and this is a totally objective and strictly factual analysis that has nothing to do with the fact that I once worked for Pairet and consider him a friend – what he and his team are doing is as amazing as it is unique. Okay, it might have something to do with the fact I know them. That I have creative pretensions of my own. And that I have a kitchen background. Ultraviolet is what happens when you take someone with an already-strong voice and give them a megaphone. 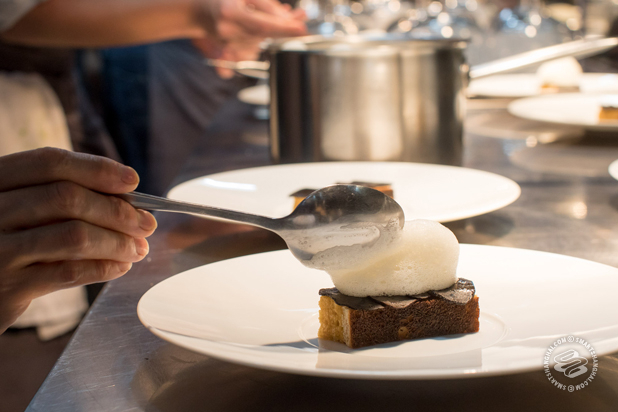 I have very strong feelings about fine dining – disgust from its self-importance, mostly – but I find Ultraviolet something completely different. It’s not art, it’s not theater, it’s not dinner. It is its own thing. And it’s also a guy with a wicked sense of humor being let loose on ten people every night. But I don’t have 6,000rmb. 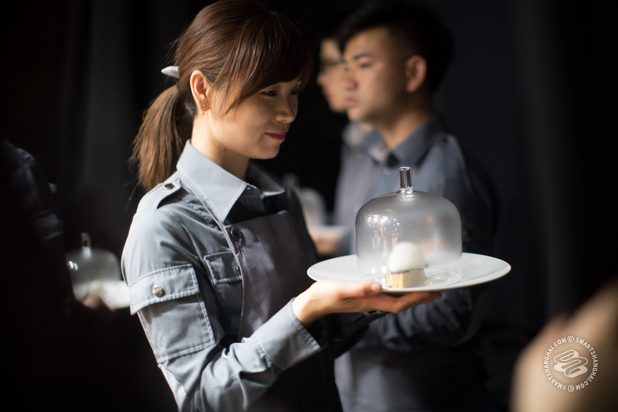 So on a recent night, photographer Charlie Xia and myself spent the evening behind the scenes for table #1,087 – there hasn’t been a single empty table to date. 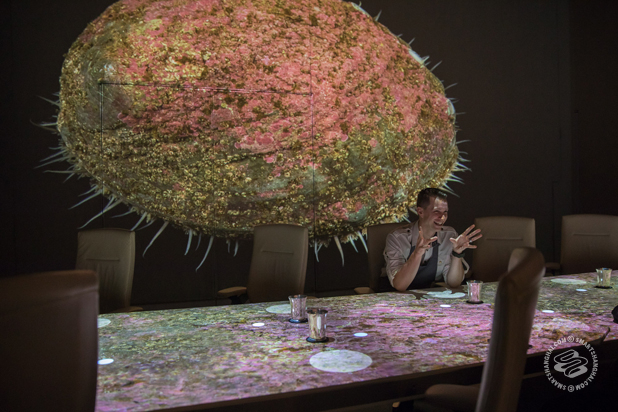 In the five years that Ultraviolet has been open, they have had two menus, which they rotate weekly: UV-A and UV-B. UV-A is stocked with classics from Pairet’s back catalog, a necessary arrangement when he and his creative team were working out just how the hell one coordinates an immersive projection, a soundtrack, the possibility to scent the room however they like, the food and its presentation (what Pairet now calls “the scenarios”). UV-B, which they added in 2013, might be most memorable for a full-fledged picnic on the grass when you least expect it. In the last couple of months, Ultraviolet has quietly rolled out UV-C, the first new menu in four years. Pairet came over from new project Chop Chop Club for the evening to walk us through the new dishes, his inspiration for them and the techniques he used to create them. But he was clear in making sure I didn’t call this new menu an evolution. The first and most important thing to realize is that there is a fundamental discrepancy between seeing Ultraviolet from the kitchen and experiencing Ultraviolet as a customer. 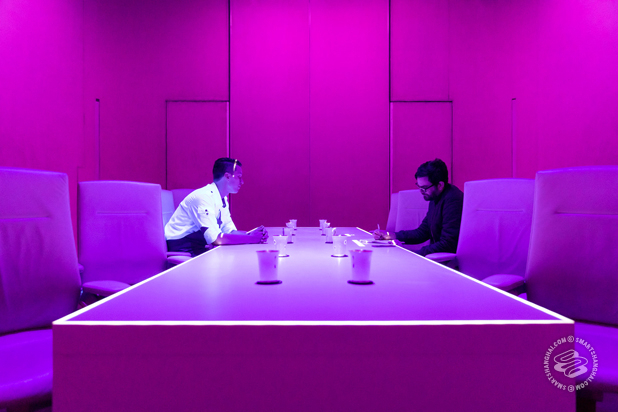 It’s not a regular restaurant; the entire point of Ultraviolet is to manipulate your sense of taste by any means: music, video, humor, your own expectations. 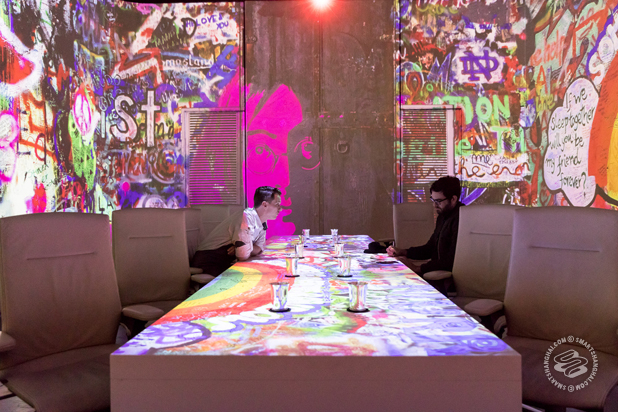 Though the kitchen served the three of us – Paul, Charlie, and me – each of the 19 courses, exactly as they went to the guests, this was not “the” Ultraviolet experience. 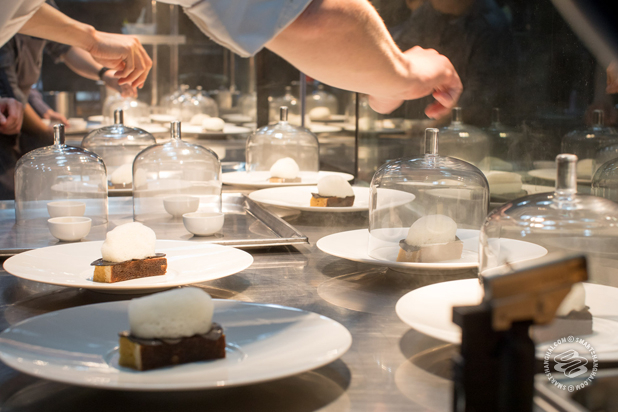 We ate the courses standing up, on the sidelines of the kitchen, sans light and sound show. 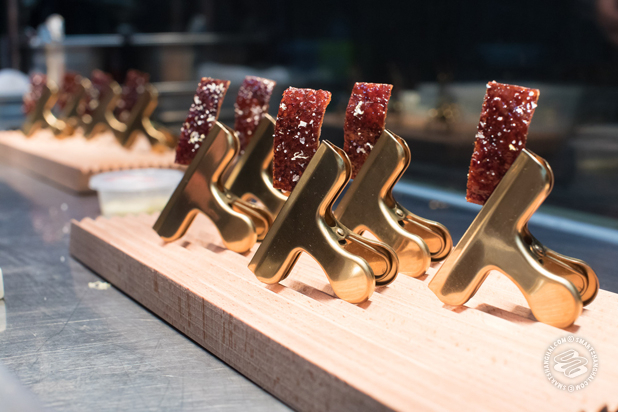 Nonetheless, what’s going on in the kitchen, and how it came to be in the first place, are great stories that involve some serious chef nerd-dom (solving the puzzle of the Coca Cola duck took 12 years) and a, frankly, confounding approach to restaurant economics. The most shocking detail is that Ultraviolet is, as they say, a “non-commercial enterprise.” That means they don’t make money. Instead of a profit forecast, they have “budgeted losses”. 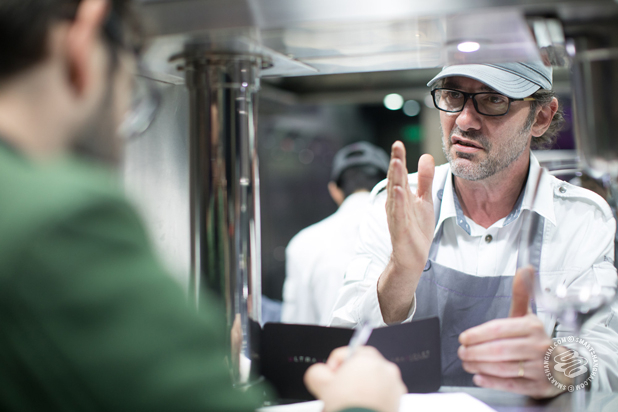 Head Chef Greg Robinson, Pairet’s right-hand man and the one in charge of the Ultraviolet kitchen, starts in on this explanation shortly after we arrive. We’re sitting in the dining room, and if it’s not surreal enough to think the pile of money it took get Ultraviolet going – the two million RMB for the kitchen, the tens of thousands for the CCTV cameras, and scent diffusers and A/V control room, the 700,000rmb for the room’s projectors, all a write-off – Robinson snaps his fingers in the air – and suddenly the pink room we’ve been sitting in begins cycling through visual projections. I wonder if they’ve dosed my water. Sparkling? Still? Lysergic? To be honest, I’ve heard and had this discussion about the $$$ side of Ultraviolet with both Robinson and Pairet many times before. The answer has evolved over the years – the “non-commercial enterprise” phrase is a new flourish – but it requires a bit of history to explain. “I want to manipulate all of your senses and invade your psyche so I can control how you taste." He tried in three cities. None worked. Eventually he came to Shanghai to open Jade on 36 for the Pudong Shangri-La hotel. A couple years later, the VOL Group came knocking. They needed a replacement for their restaurant on the sixth floor of Bund 18. 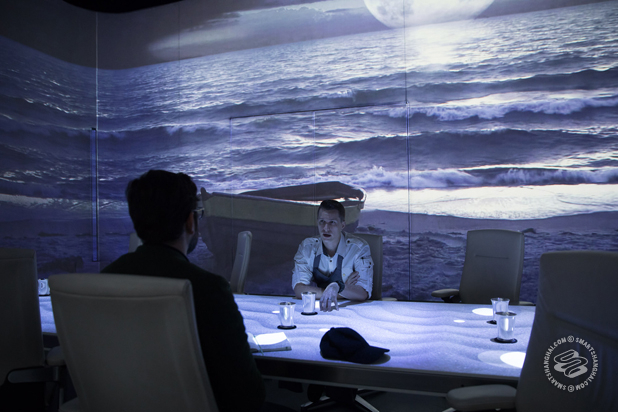 The Michelin-star-rent-a-chef thing they had going on was not working anymore. But they couldn’t just get rid of the lease; the sixth floor and seventh floor were bundled together, and the seventh floor wasn’t doing so badly: it’s Bar Rouge. So VOL recruited Paul. And, in a way, Paul recruited them. He would give them Mr & Mrs Bund, a popular, high-volume French restaurant, and in return, they would give him Ultraviolet. Mr & Mrs Bund opened in 2009 and was a hit straightaway. Construction on Ultraviolet started the next year. That still doesn’t answer the question of why someone would run a restaurant like a non-profit (since raising the prices in 2015, Ultraviolet supposedly comes closer to paying for its operating costs, but the initial investment… forget it). While at Ultraviolet last week, I asked Pairet about this mystery again. He talked about VOL, brand positioning, reputation building, and special projects, like the time he and five staff flew to Versailles to do an Ultraviolet dinner for 320 people. I have to admit I still don’t quite get it and I probably never will. My best guess – pure speculation – is that the relationship between the man with the money and Pairet is more wealthy patron / brilliant artist than something more directly transactional. 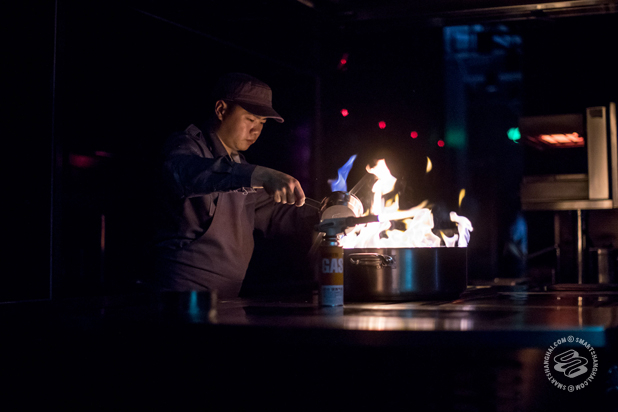 However it works, Ultraviolet is, according to Ultraviolet, a restaurant so heavily invested in the customer experience (there are a minimum of 25 staff working each night) that even at nearly 900 USD per person, they are still not even covering the operating costs. The staff top-to-bottom is trained like a unit. The van driver is trained to operate the full audio-visual show if need be. Ultraviolet. Lots to talk about, and we haven’t even touched the food. Enough theory. Let’s look at some cooking! Presenting: Ultraviolet's new menu, UV-C.
Like any good EDM deejay, Ultraviolet knows you’ve got to kill it with the first song. Huge bass. Big drop. Hit ‘em with the abalone. 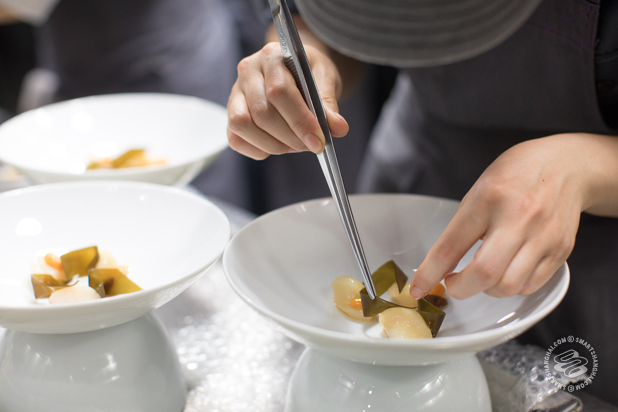 That’s what happens with this, the first dish, the ‘Abalone Primitive’. It’s an experience, even just being in the kitchen. 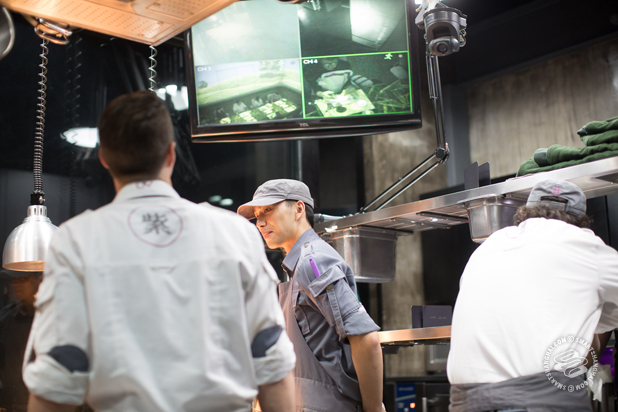 The chefs are milling about until someone pokes their head in, and very formally says, “Kitchen, they have arrived”, and then all the lights go off. A foghorn wails, the doors between the dining room and kitchen open, and all the chefs are hiding out of view, on the edges of the kitchen. Then the Haka chant from the All Blacks’ rugby team echoes through the place, and then this guy starts lighting stuff on fire. Phew. Spectacle. World’s Top 10 DJ stuff right here. Pairet pushes up the sleeve on his jacket and points to his forearm. “Look at this,” he tells me. 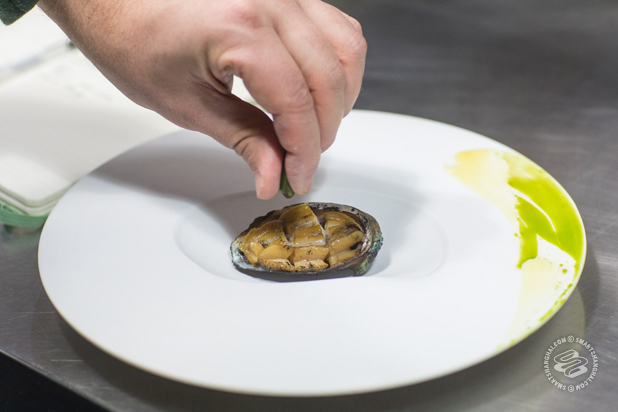 What’s actually happening is a beautifully simple process (in theory — in practice, Ultraviolet is always fairly complicated), where these small abalone, the things with the whitish shells, have been placed on these darker river stones, and then surrounded by a kindling of dill, peach wood, rosemary, and straw, lit and then fuelled with pastis. 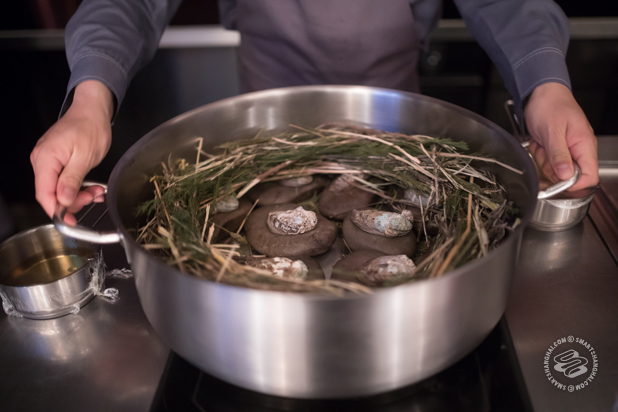 The lid goes on, the kindling burns out, and the abalone end up being both perfectly, quickly cooked and smoky and herbal from the wood, the dill and the pastis. Pairet explained a similar technique on the French coast called éclade, where mussels are covered in pine needles and set alight. It’s campfire cooking of the highest order. A squeeze of yuzu and done. 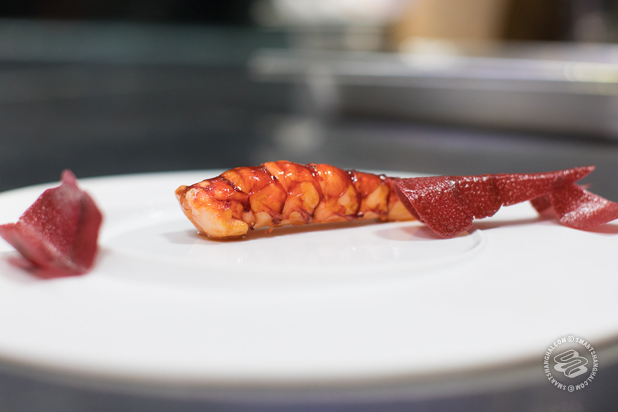 These red prawns, called 'Carabineros de Huelva', are the second course. They go through the perfectionist Pairet-machine and come out like the third picture down. Pairet explained that in Spain, they’d eat these with the shell, and so, naturally, he has removed their shell and made a new one out of about a million ingredients, including lime, licorice and beetroot, and then molded that to look like the original. You eat it. 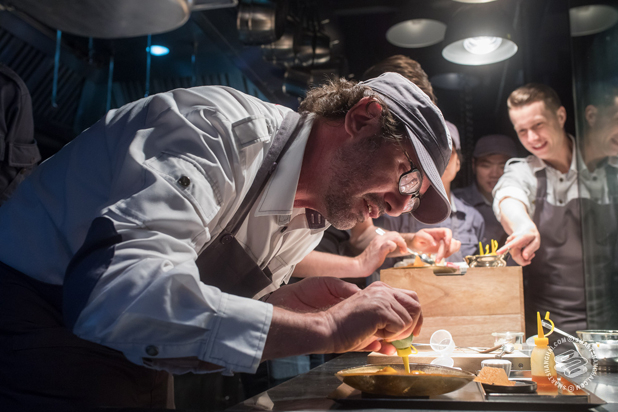 I don’t want to give away everything – the surprise is a big part of the fun of eating at Ultraviolet – so let’s just say these guys and girls are working on a couple other dishes in “The Sea” part of the menu. 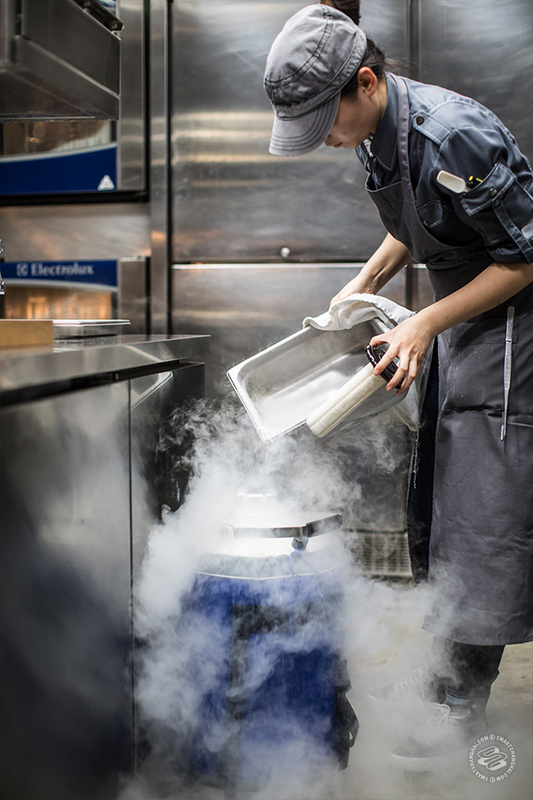 Ain’t no party like a liquid nitrogen party. This is the part where we all had to swear our eternal souls to Pairet, who dabbed us with his holy pink elixir, dispelled the illusions from our hearts and made us dance Krishna’s Dance of Divine Love. Just kidding. It’s soup. 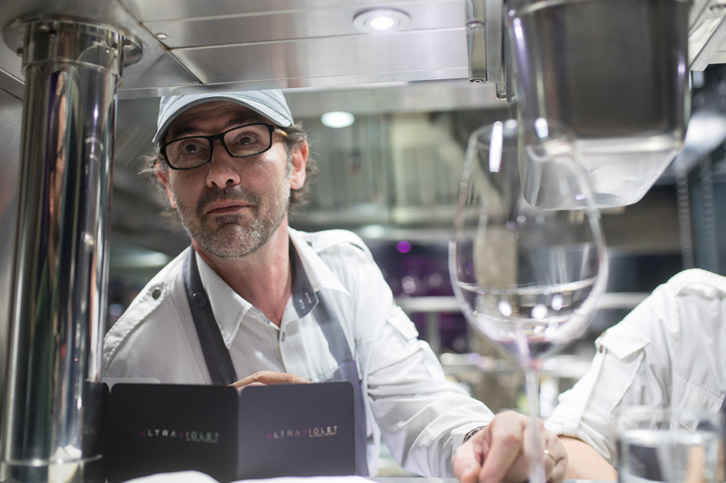 When the Michelin guide came out last year, there was a lot of speculation about whether Ultraviolet would get either two or three stars. They ended up with two, as did Yongfoo Elite... but this isn’t my rant against Michelin. 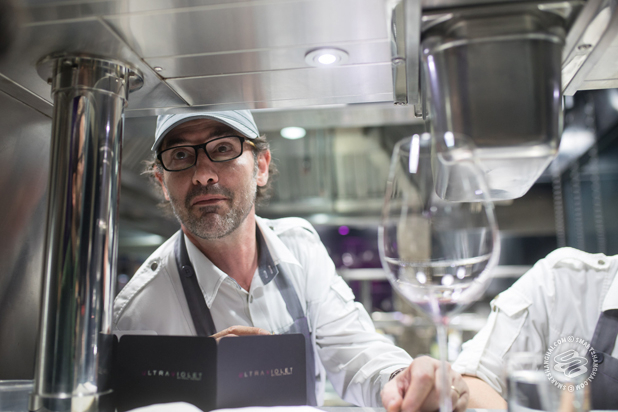 It’s only to say that Pairet has made a kind of peace with the tired tire company, or at least enough to joke that the next dish “is why we won’t get three Michelin stars”, a piece of low-brow culture unbecoming of a three-star temple. This is the "D.I.Y.B.A.L.T." 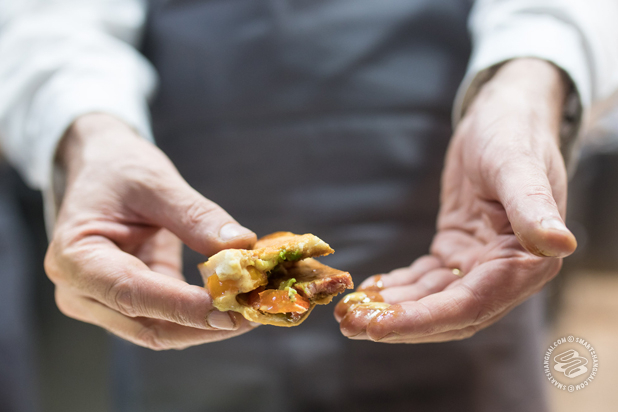 A do-it-yourself bacon and avocado sandwich, Pairet-style. 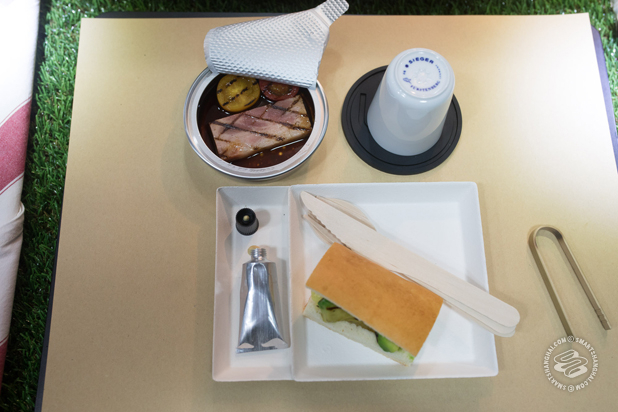 The presentation looks like it’s been swiped from an airline, with the sealed tin of grilled bacon and tomato and the metallic tube of aioli. 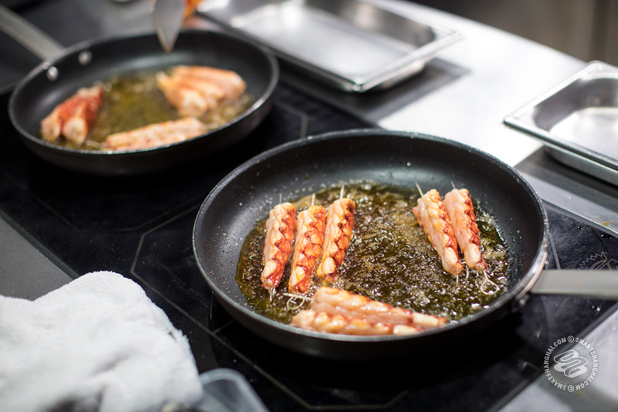 “In some ways, this is a harder dish to do than a fancy lobster with whatever infusion,” Pairet says between bites. Over the course of the night, he’s been telling me about directing people’s imagination and their emotion through his dishes, but suddenly he turns serious and reflective, a spider stuck in his own web. “Do you remember the times in your life when you’ve been happy?” he asks rhetorically. What are you going to say to that, huh, Michelin? Huh? Find me a better sandwich than that. Two stars for the story; one star for the sandwich. If there is an iconic Ultraviolet dish, it is this, a piece of toast soaked in meuniere sauce. 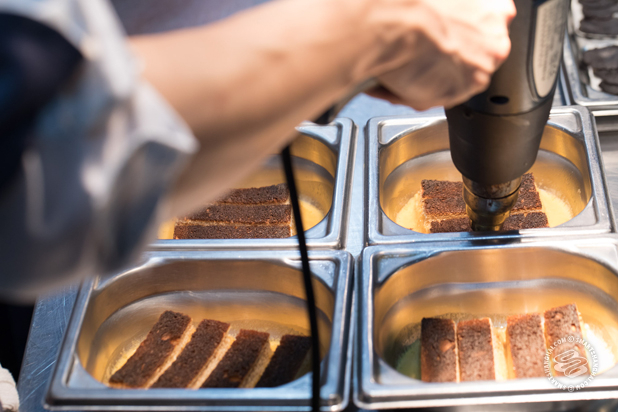 It’s the only dish to appear on all three Ultraviolet menus (and in larger form at Mr & Mrs Bund), where it’s called the "Truffle Burnt Soup Bread". It’s also the only dish on the menu to require a power tool. Here’s the little soldiers all lined up, soaking in the meuniere, being blasted with an industrial hot air gun. This dish and its origins have been written about a lot. It evolved from Pairet’s habit of dipping bread-ends in leftover meuniere sauce at the end of dinner service. And I can attest to that. I remember seeing him do it. But there’s an important and missing detail: Pairet was never smoking his dinner, the way he now smokes this dish. That came later, after a trip to San Sebastian. Pairet was in the Spanish city, arguably the country’s food capital, for a conference or something. He’s sitting in the crowd watching a chef on stage do a demo. 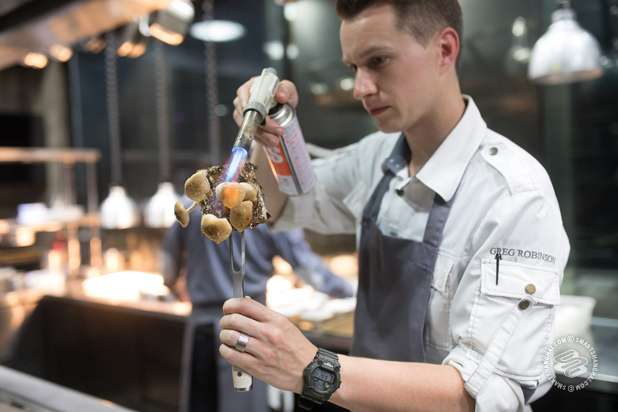 The chef isn’t actually doing much: slicing some cepes, arranging them on a plate. He dabs a little bit of cream that he’s infused with a cigar on the cepes. Pairet laughs as he recalls the anecdote, still amused all these years later. “I couldn’t tell – I still can’t tell – if the guy was a total fake or a genius,” he tells me, though judging from his tone of voice, I don’t think it’s genius. And yet, in memory of this guy, and in memory of the absurdity, every single one of these truffled pieces of bread now gets a puff of cigar smoke, held under glass. Allow me to get technical for a moment. Roasting a crispy duck is not hard. That is entry-level cooking. Lacquering and roasting a duck is not hard. That is also entry-level. Yet for some reason, a reason that took them 12 years to figure out, when you lacquer a duck with Coca Cola syrup, the skin softens. That reason turns out to be a combination of glucose and citric acid, both present in Coca Cola syrup. Their natural properties were moistening the skin and ruining the crispness. So Pairet did what anyone who has personal access to an industrial fragrance and flavor company would do: he asked them to make him a dry Coke-flavored powder. 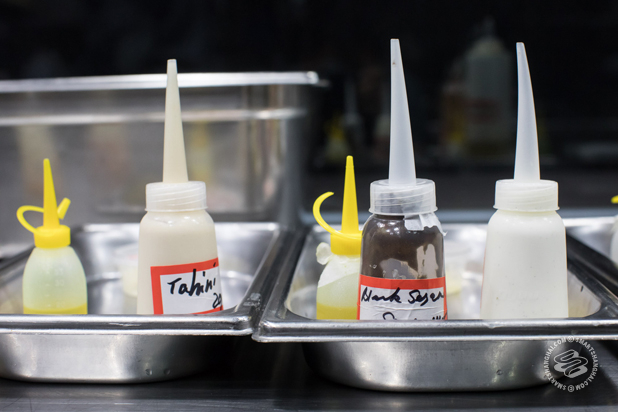 Once he had the powder, he was able to substitute the glucose with isomalt, a different form of sugar, use that as the lacquer and then sprinkle a bit of citric acid back onto the skin of the duck just before serving it. The rest is a totally simple roast duck recipe that anyone could do at home: fill the duck with air to separate the skin and meat (the basis for Peking duck), hang it to dry, baste it, dry it again, roast the duck, fry the duck, roast the duck again, lacquer it with your homemade Coke syrup, and roast it a third time. 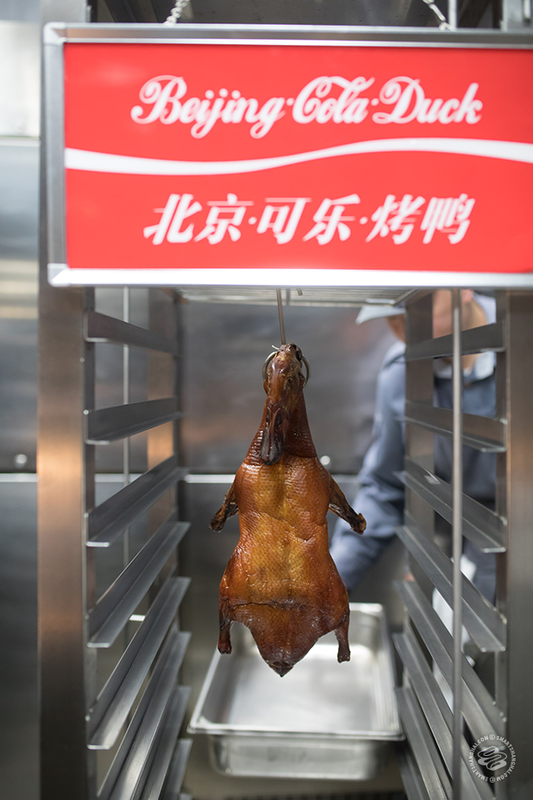 The result is perfectly crisp, Coke-flavored duck skin. But, hey, you, customer! You didn’t have to put in 12 years of work to figure it out, and so it is totally worth the effort. Perhaps because of the years of work that went into creating the perfect piece of skin, they are quite precious with it. This is the portion for half the table. One stamp of perfect Cola duck skin each. One point two years of development per piece. What else do you need to know about Ultraviolet? Let’s have a little wrap up. They cook mushrooms like s’mores. 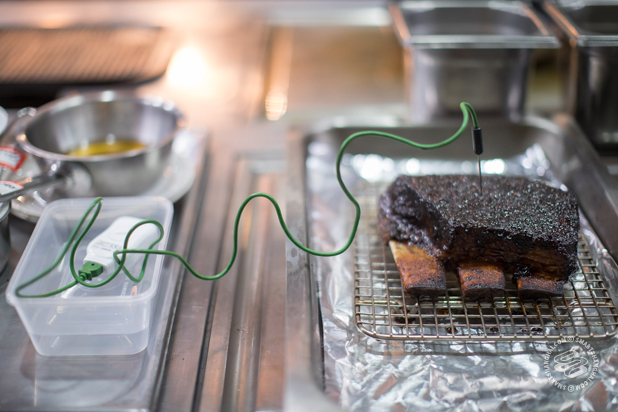 Their short rib is cooked with a phone charger. 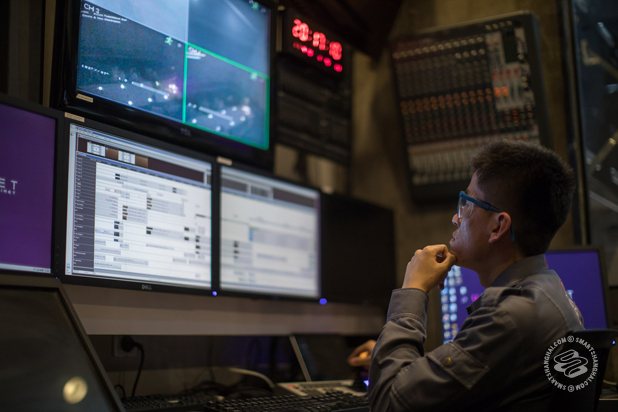 The full-time A/V technician uses protective eye wear. Their kitchen equipment is different to your kitchen equipment. 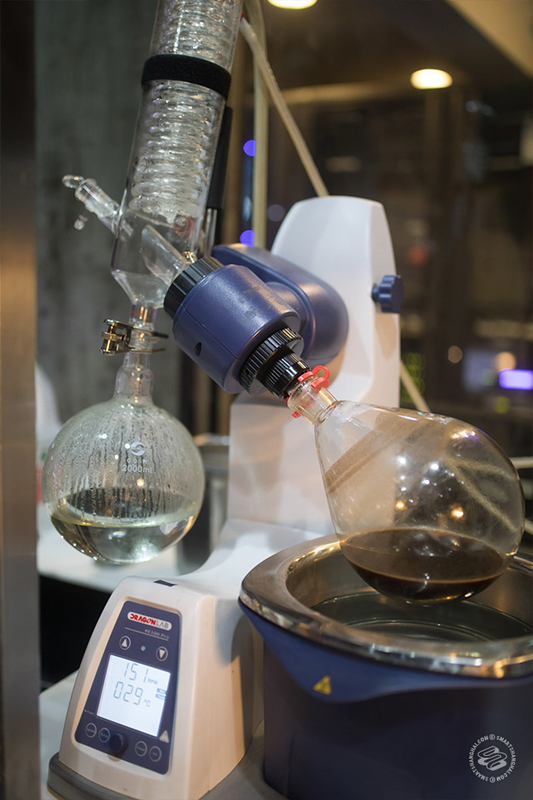 This is a Rotovap. 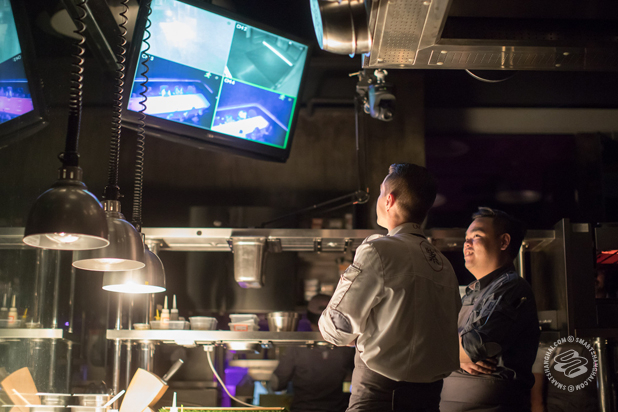 The lasting impression of a night in the Ultraviolet kitchen, besides the excess of eating almost 20 courses, is control and efficiency. 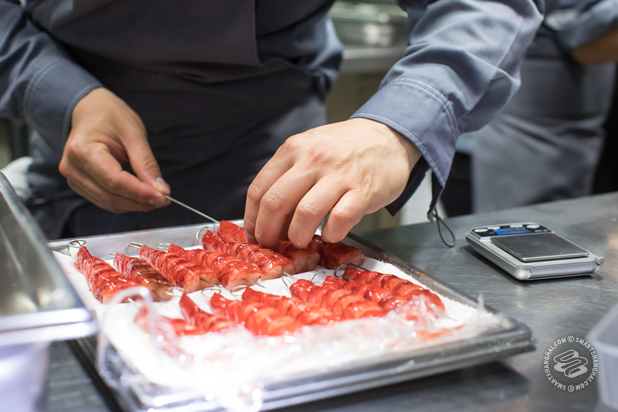 There is a silence to the kitchen that comes only with the shared knowledge of exactly what needs to be happening right now, what needs to be happening five minutes from now, and what needs to be happening 55 minutes from now. It will not come as a shock to Pairet to hear that I didn’t like some of the dishes. At one point in the evening, he tells me “what I like with having 20 courses is that you can have an unbalanced menu.” He explains that he can push the dishes to be just that much more sour, or smoky, or bitter, or whatever other goal he is going for, when he has so many chances to play with. He doesn’t need you to love every dish. That said, having known Paul and his food for a dozen years, he is clearly at the peak of his powers with the UV-C menu. 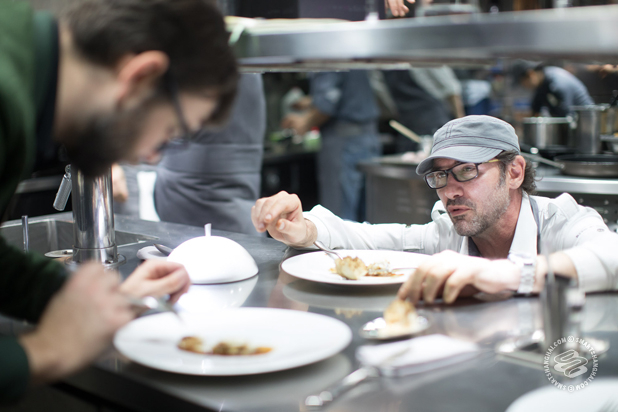 Watching Pairet’s vision in action is inspiring and hearing the back stories of the dishes even more so. If there is a criticism, it’s that the kitchen lacks the blood and fire and chaos that many chefs (myself included) are so drawn to. But then the stated goal of Ultraviolet, its entire existence, is to eliminate that chaos, and by eliminating it, creating possibilities that would just not be feasible in a normal kitchen. I found the utter professionalism extremely rewarding to witness and, as an aging man, slightly threatening (damn talented youth). 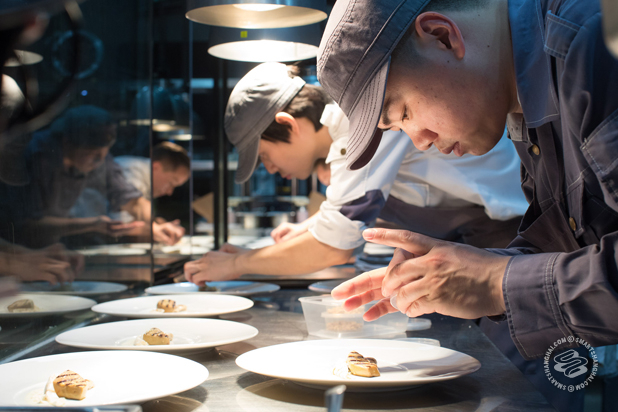 The driver can operate the audio-visual show, the dishwashers can fill in for the servers, and the young Chinese cooks are as good as any of their counterparts around the world. I suppose it’s the difference between improv and a Broadway play. Ultraviolet has rehearsed more than 1,000 times, and even watching from the wings, it’s a great show. Ultraviolet accepts online booking only. Information right here. 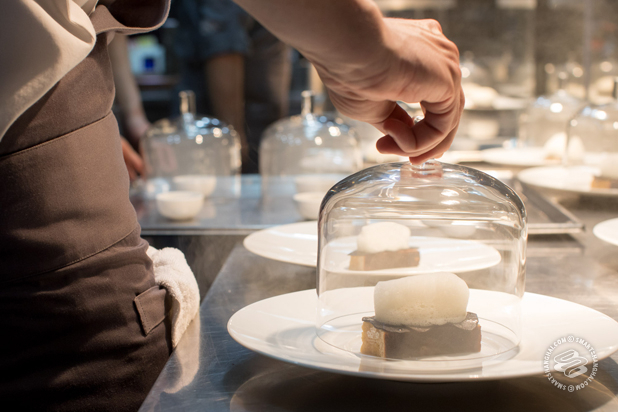 I've eaten a full Pairet tasting menu 3 times - once at Jade on 36 and twice at UV. I always tell people who ask if it was worth it "not for the food, but if you consider it a very expensive night out - then yes." Of course I got to UV early enough to be in dinner 11 and somewhere around dinner 370 or so. But back then the dinners were like 3k a night - 6 thousand is some serious I'll think about this twice or three times cash. Maybe before I leave Shanghai again. 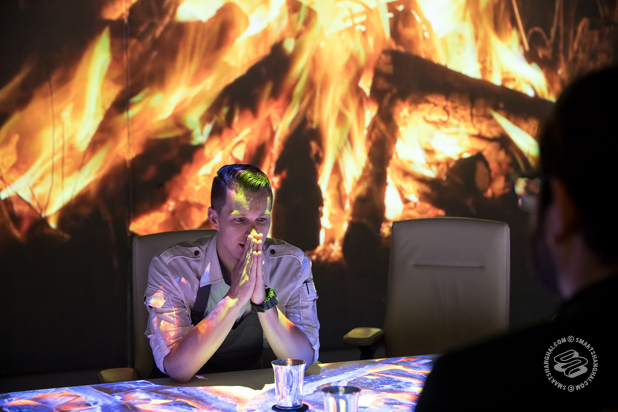 As to the profit thing - they told us that they were going to make money on the things they learned from cooking at UV - doing research for kitchen equipment companies, corporate catering parties and events, and sponsorship from their partners. My absolute favorite dish was the microfiche - no chip. I also remember they had a Coca-Cola noodle dish at Jade on 36 - and that was like 9 years ago, so they've been obsessed with the Coca-Cola thing for a long time. The noodles weren't very good. Fantastic, in-depth look at one of Shanghai's "mysteries." Well done!